If you want to shop for original painting, drawings, jewelry and everything art and would love to support future artists in Houston, then you need to come out the Annual Student Art Sale at Glassell Studio School. This is a two day event only, so make sure you don’t miss out! 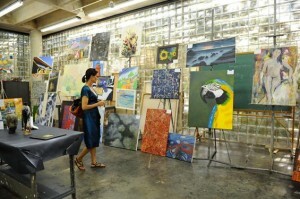 The sale will be taking place May 27, 2011 (5pm to 8pm) and May 28, 2011 (10am to 5pm). The Glassell Studio School is located at 5101 Montrose Boulevard. Shop for original paintings, drawings, prints, photographs, jewelry, ceramics, and sculptures—all created by student artists at the Glassell Studio School. Come early for the best selection. Proceeds benefit the Glassell School of Art scholarship fund. The Glassell Studio School offers courses in art history and studio art for adults, ages 18 and older. Studio courses and workshops are available in a variety of media, including painting, watercolor, printmaking, photography, ceramics, sculpture, and jewelry. For more information on Glassell click here.